Boards Ran Red at Jamaican President's Tourney! 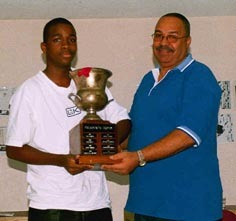 Ian Wilkinson, "Rising Star-- Brandon Wilson-- Triumphs," 29 August 2002 (St. Andrew, Jamaica). In the last round, played on Sunday 25th August, 2002 at the Norman Manley Law school, UWI, St. Andrew, Jamaica, BrandonWilson delighted the spectators with strong play and quickly and convincingly defeated Mark Henry in a sharp Sicilian, Wisdom continued his momentum earning the full point after using the Black pieces to pluck O'Neil Charles' Bird; Samuel Lamount prevailed over Otto Williamson; Ian Wilkinson employed the Petroff, refused an offer to draw and missed a clear win over Blackwood ultimately losing; and Andrew Mellace won on time over Sidley Matthews in a French Defence after the arbiter ruled that Matthews had failed to make the required number of moves to make the first time control (40 in 90 minutes). Brandon Wilson accepting President's Cup from former JCF President, Frederick Cameron. To summarise, the 2002 edition of the President's Invitational was an exciting tournament which kept the spectators rapt right to the end. The standard of chess in some games was excellent. A lot of "bloodletting" occurred. In 45 games, only two were drawn! White was victorious 26 times and Black 17. This tournament will, in my humble opinion, continues to grow from strength-to-strength especially with so many talented players coming to the fore. Photo by Jamaica Ambassadors Chess Academy.